Making risotto, to me, is almost like meditation. It involves all of your attention and focus on doing something so simple, repetitive and peaceful. It’s all about stirring the pot and adding the broth in intervals. Try this technique…you’ll end up in a trance that your family will probably knock you out of as they coming running into the kitchen, cheering and hungry, once they smell it cooking! This dish was inspired by a recipe I had found in Food & Wine magazine over ten years ago! I have improvised it so many times, but I think this version is my favorite. 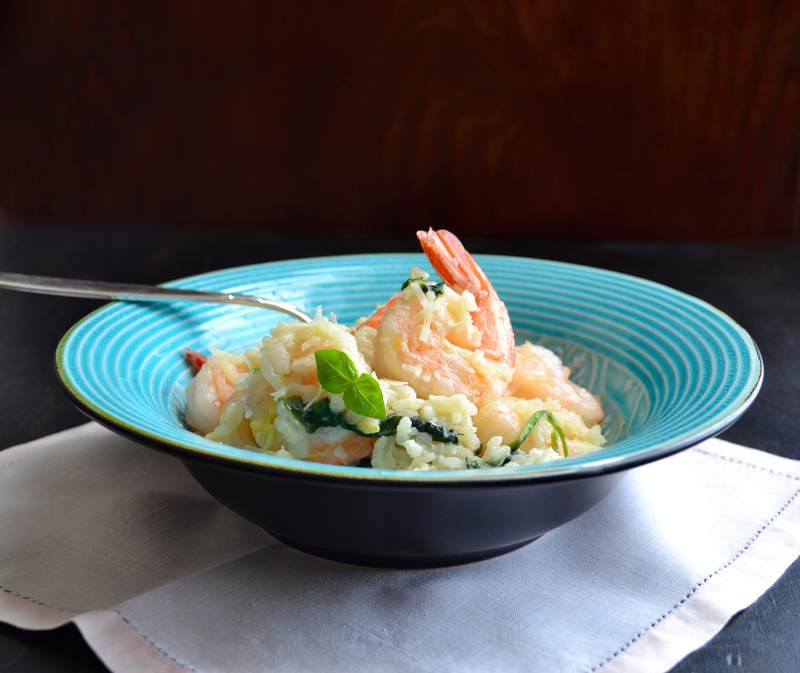 The tangy saltiness of the feta really is delicious against the richness of the risotto. I throw in some spinach because I love it. It adds some pretty color and lastly, spinach makes me feel just a little less guilty over eating this! You can use any feta you like. I like to use French or Bulgarian feta because they are extremely creamy and they have a remarkable flavor that you’ll love. They honestly do not taste like any other feta. They work so well with risotto, where that creaminess is the goal. You'll love this no-fail method for cooking perfectly creamy risotto. In a large pot over high heat, bring the broth to a boil. Add the shrimp and simmer for about 3 minutes covered until just cooked. Be careful not to overcook them. Remove the shrimp with a slotted spoon or small sieve and keep them in a bowl until ready to use. Keep the stock on a medium low heat to continue simmering. In another large and heavy bottomed pot, melt the butter and olive oil over medium high heat. Add the onion and sauté for about 5 minutes until softened, then add the garlic. Continue to cook for another 2 minutes, then add the rice. Stir to coat the rice with the oils and cook for about 2 minutes. Do not get any color on the rice. Add the wine and simmer until mostly evaporated. Using a large ladle, add about one cup of broth to the risotto and stir. Keep stirring as the rice absorbs the broth. As soon as you see the rice becoming more dry, add another ladleful. And stir. And add. And stir. You get it. Keep this up until the rice becomes tender and creamy, but still has some body. This will take about 25 minutes. Remove the rice from the heat and add the shrimp, basil, spinach, feta and lemon zest. Serve with some freshly grated Parmesan on top. Food & Wine magazine had suggested a crisp Sauvignon Blanc with their version of risotto. I think either that, or a wonderful light Pinot Grigio would work well with this recipe. If you feel the rice is done and you have a tiny bit of broth left, don't feel that you have to keep cooking. If it's done, it's done. You don't want mush. Save the broth though, you may find that once you remove the risotto from the heat and add the final ingredients, you may want to add that broth to "loosen" things up. How can we adjust cooking for using brown rice? Hi Mindy. There are some techniques where you can make a risotto type of dish using brown rice, but I haven’t tried them. I know the results are much different from the creamy texture you’d get from the arborio rice. Whaaaat are you doing to me?! This is delicious looking awesomeness. Spinach negates all calories, FYI. No guilt. And now I feel like I need to carefully read all the feta labels! I think I’ve been missing out! Thanks so much Peter! I’m super flattered! This is one of our favorite dishes! I make it often! Your Friday Five Risottos are all really beautiful! Thank you for including mine! This looks beautiful. So simple but I am sure it has plenty of flavor. Well, thank you so much Peter! I’m flattered! It really is delicious…this is one of those recipes I seem to make often.